I keep getting stuck in a rut of what I am feeding my kids for lunch. My go-to and their lunch of choice is mixed fruit, cottage cheese, and a treat. I want to mix it up, and add more meat that isn't chicken nuggets or hot dogs. Like most moms, life is hectic. We normally have lunch between 11 and 12, this is going to change with Ella doing gymnastics one day a week during this time frame. I also get lost in the day and don't realize what time it is. If Ella has school we have to be out the door by 1245 and we start getting ready at 12, cause with 2 kids one of them argue about something, either be brushing their hair or teeth, or putting on shoes. Life happens and we all start look for a easy simple somewhat lunch to make. While searching Pinterest the one day I came across some great ideas for lunches. 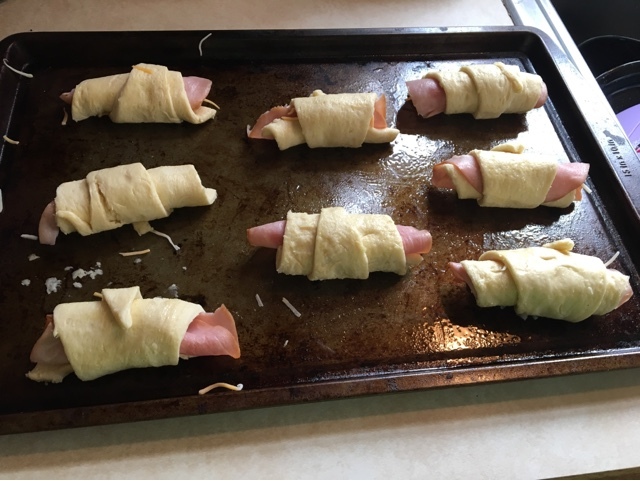 Ham and Cheese Roll-ups being one of them. 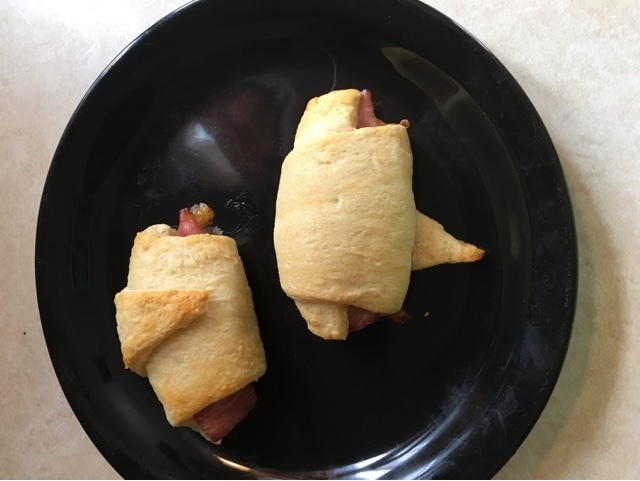 I had originally planned on doing either turkey or chicken, until I realized both of those were expired (MOM of the year, but we don't eat lunch meat very often) so Ham it was. It was a WIN!!!! 1- Preheat oven 375 degrees. 3- Unroll croissants on baking sheet. 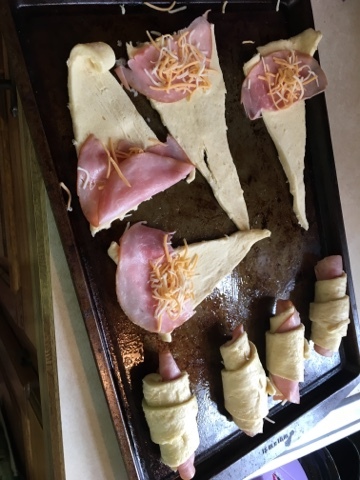 Add 1 slice of ham to each triangle and a little bit of cheese. 4- Roll up and repeat with all croissants. 5- Bake for 11-13 minutes, until lightly browned. What are you go to simple, easy, somewhat healthy lunches for kids?